WinZip - Knowledgebase / WinZip / Email / Why aren't WinZip's email features working for me? Note: This article does not include information concerning the email feature in WinZip Jobs. Zip and E-mail: Right click files or folders and click this WinZip option to quickly attach a Zip file to a new email message. If any of the files are photos, you will also be given the option to resize them, which can significantly reduce transmission time. Zip and E-mail Plus: This works like Zip and E-Mail but also allows you to specify the name of the Zip file and to add encryption if desired. 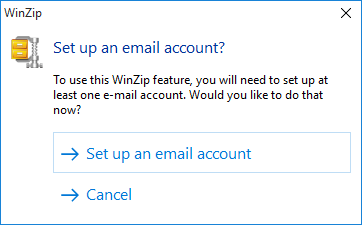 Email: If you have a Zip file open in WinZip, you can click this button in the Actions pane (additionally available in the Create/Share tab and in the Unzip/Share tab). If you use the Email button, a copy of the entire Zip file will be attached to a new email message. If you select any files or folders in a Zip file, right click in the highlighted area, and choose Send Selected Files To Mail Recipient (Zip and E-Mail), WinZip will offer you the option to send only the selected files or the entire Zip file. If you use an email program such as Microsoft Outlook, Thunderbird, or Windows Live Mail as your default email program and if WinZip is configured appropriately, WinZip's email features will work with your email program. What makes this possible is a protocol named MAPI (Mail Applications Program Interface), specifically Simple MAPI. MAPI is a standard Windows interface that allows WinZip and other programs to instruct your email program to create a new message and attach a file to it. Generally, you would only need to have your email program set as the default and have an email account configured, to have simple MAPI working. 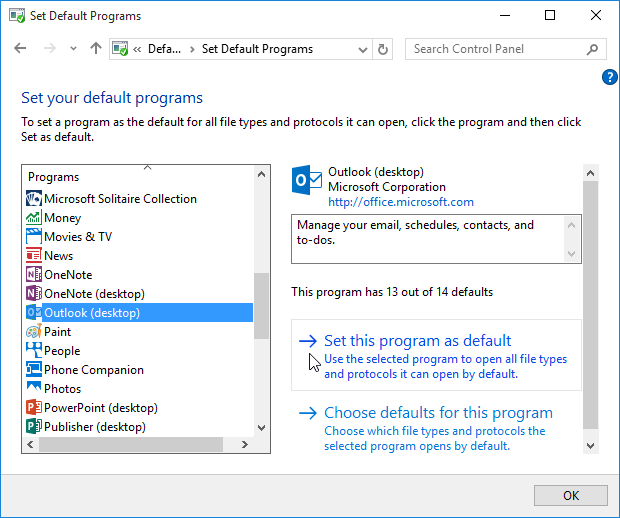 It is not uncommon for an email program to let you know that it is not set as the default when you open it. Usually, this information dialog will also make it possible for you to set it as the default. If you do not have a MAPI compatible email application, WinZip will use its own built-in email program. A configuration option is also available if you would rather use the WinZip emailer even though you do have a MAPI compatible email program. In the case where there is no MAPI compatible email program, you can conceivably have WinZip's email features working, but the Send To Mail Recipient feature used by Windows and other programs will not work, as they rely on MAPI. You will need to define an email account in the Email tab of the WinZip Options dialog before you use WinZip's built-in email program. Otherwise, you will be prompted automatically when you first try to use one of WinZip's email features (see the picture below). If you are not successful or if you need assistance, please send an email message to Technical Support.